BIODIVERSIVIST: CleanTechnica Watch: Is Thorium A Future Option For Nuclear Energy? But Russia's breeder reactor which just went into commercial operation would make the abundance of thorium a moot issue if it became a common design, and would also reduce waste, which is actually an amazingly small amount per unit energy already. Breeder reactors are for real, and would essentially make nuclear power into a renewable energy, although there's actually plenty of uranium around anyway. It also has a passive cooling system using air convection that operates without any power to the station. GE's Advanced Passive 1000 MW reactor also uses passive safety. Loss of power like that at Fukushima automatically connects the hot reactor to a large tank of cooling water. China will bring a passively-safe pebble-bed design on line next year. No pumps and no diesel generators are needed for any of these designs to keep the fuel from melting should there be a total power failure. ...something to fight for as the path to better quality of life with stronger communities and better personal relationships. Energy Democracy traces the origins of the Energiewende movement in Germany from protests against the industrialization of rural communities in the 1970s to the Power Rebels of Schönau and German Chancellor Angela Merkel’s shutdown of eight nuclear power plants following the 2011 Fukushima nuclear accident. The authors explore how community groups became key actors in the bottom-up fight against climate change (emphasis mine). Solar and wind clearly have a place along with nuclear, but energy democracy is a fad that has yet to run its course. When was the last time you read an article about the 100 mile diet or how to convert your Jetta to burn biodiesel? Basically, the first nuclear reactors were actually built to produce material for nuclear weapons. The nuclear power plants we have today were derived from this design. To be more exact, some aspects of some of today's nuclear power stations retain some aspects of some of those early reactors. Most still use uranium for fuel and that is about where the similarity ends. The first reactor to connect to a commercial grid was in 1957. The first nuclear sub sailed in 1954. So, it was this proven ship power station that most reactors are similar to, not weapons grade plutonium production reactors. Utilities and the government did not want potentially safer reactors to succeed, lest the public demand the immediate shutdown of the reactors already built, which have the worst possible design of all the options originally on the table. There's not a grain of truth in any of that. Some reactor designs have more safety features than others. The public is not going to demand that we close all other power stations a few years from now when the new AP 1000 reactor comes on line with all of its new passive safety features. In fact, the one that blew up in Chernobyl was technically a military reactor repurposed for power production. Finally he got something half right. It was a dual purpose reactor. The reactor fuel melted, which caused a steam explosion which blew the lid off of it. It then burned in the open air for several days because it didn't have a modern containment dome. One big difference between cold-war era weapons production reactors and commercial ones would be all of the safety features, like a containment dome. There are only 11 reactors of that basic design left, all in Eastern Europe, all heavily modified for better safety. The Chinese have also tried their hand at the kind of thorium reactor described in the movie, and they could not quite get the technology to work either. They may conclude that other designs are more viable. 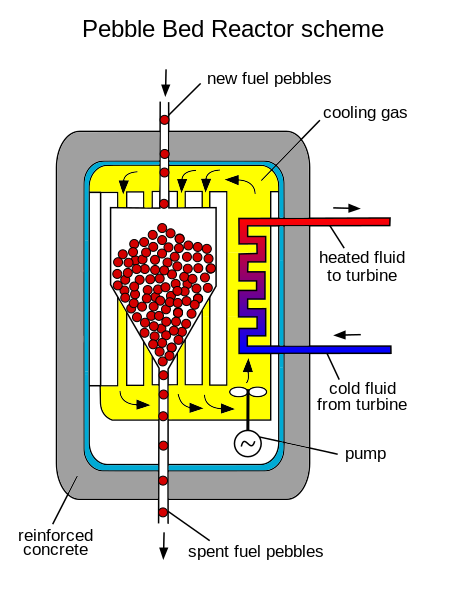 For example, they will be bringing a meltdown-proof, gas-cooled pebble-bed reactor online next year. So should we go ahead with thorium? As the Chinese and German examples show, more than one prototype will be needed. If each one comes at a price tag of 1 billion euros, we are talking about a lot of money. Let's see ...that would be 30 prototypes a year for the ongoing $30 billion annual cost of the German energy transition. So, yes, we should continue to do basic research. The nuclear waste issue has been exaggerated to the point of absurdity by antinuclear energy groups. The quantity per unit energy is quite trivial and technological solutions abound. Attempting to recycle billions of worn out solar panels isn't going to be an environmental picnic. By the time we figured that out, the falling cost of solar + wind + storage would, no doubt, make thorium uninteresting. Thorium has already been made less interesting by other competing reactor designs. Cheap storage would benefit nuclear more than it would wind and solar, so be careful what you wish for. Because solar and wind become less and less economical at higher levels of penetration, they will never be able to do it all. They will need a lot of help from their most powerful low carbon ally. And we already know for certain that renewables are inherently safe. Actually, nuclear is as safe as any renewable per unit energy produced. This link lists accidents associated with wind turbines. The film has technical errors and one too many conspiracy theories trying to explain why thorium molten salt reactors are not the dominant design. Even the subtitles had typos. I'm all for more research on thorium reactors, but my biggest criticism is of the filmmaker's repeated use of debunked 70's era antinuclear energy tactics to bash existing nuclear power stations. They expend considerable footage following some Japanese farmer on some island who is trying to get his fellow townspeople to install an (as yet nonexistent) thorium molten salt reactor so that its waste heat and power can be used in greenhouses to increase productivity and create jobs ...which will in turn prevent young people from moving away and motivate women to have more babies. There's a scene with this farmer hawking his game plan in a meeting where the understandable lack of enthusiasm by the other people is obvious. I can see the advantages of small modular reactors in remote places like islands, but this farmer footage should be on the cutting floor. They portrayed the three incidents of note in over a half century of operation (TMI, Chernobyl, and Fukushima) as flashes from atomic bomb detonations. If the water vanished because of a pump failure for example then the reactor would go out of control and explode. That's what happened 45 years later at Chernobyl. A reactor going "out of control" because of coolant loss is unique to the RBMK Chernobyl design, of which only 11 highly modified versions remain. Chernobyl was not caused by a pump failure and the reactor fuel did not and cannot result in a nuclear detonation. Antinuclear groups have always worked to give the public the impression that the Chernobyl and Fukushima core melts resulted in the equivalent of nuclear bomb explosions. It is very different from most other power reactor designs as it derived from a design principally for plutonium production [weapons grade] and was intended and used in Russia for both plutonium and power production. When the void coefficient is negative, an increase in steam will lead to a decrease in reactivity ...This leads to a reduction in power, and is a basic safety feature of most Western reactors. ...the reduction in neutron absorption as a result of steam production, and the consequent presence of extra free neutrons, enhances the chain reaction. This leads to an increase in the reactivity of the system. The reactor cores at TMI and Fukushima melted as a result of not having enough cooling water. The nuclear reaction did not increase and cause them to melt as was the case at Chernobyl. As is usually the case with any antinuclear article with a comment field, this one drew a great deal of pronuclear comment. If some of your comments were never posted, or deleted after being posted, feel free to repost them in this comment field. There were 509 comments before being shut down.